Over the summer, fans became excited when it was announced that Rihanna would be joining NBC’s ‘The Voice’. Today the first teaser for the forthcoming season hit the web and let me tell you, it’s nothing less of what you were expecting. 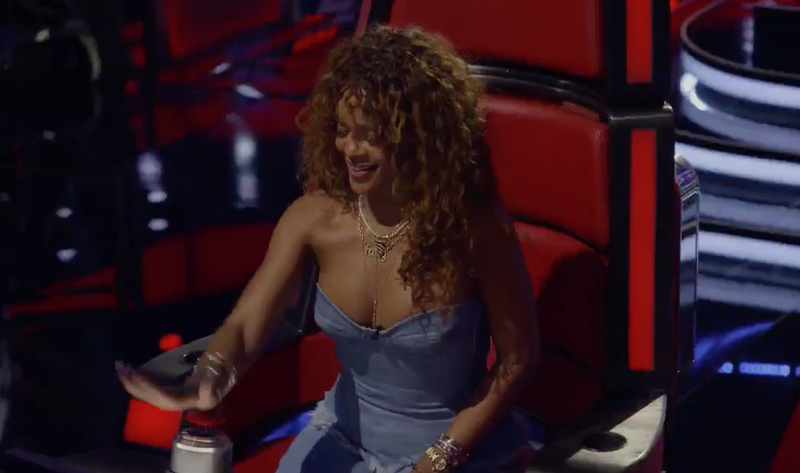 in the teaser, Rihanna gets familiar with the infamous spinning chairs and the rest of the celebrity judges. Throughout the teaser, it is revealed that not only the contestants are starstruck but so are the judges. “Action!” yells Pharrell as Gwen Stefani claps in excitement. The 1-minute teaser is full of laughs, sass and bad gal moments! While Rihanna’s anticipated eighth album Anti is set for release in November, the new season of The Voice premieres on October 26th on 8PM EST. Check out the first look at NBC’s forthcoming season of ‘The Voice’ below! New MV: Bruno Mars - "Gorilla"
New MV: PartyNextDoor & Kylie Jenner Make It Official With "Come & See Me"
New MV: Macklemore & Ryan Lewis Return With "Downtown"
New MV: Omarion, Chris Brown & Jhene Aiko Swag It Out For "Post To Be"
Is AronChupa's "I'm An Albatrouz" The Next International Smash Hit!? Nicki Minaj Rides Motorcycle To The Super Market!